Problems have only started relatively recently, so they are probably not related to any previous occupants of the house or land. Paranormal occurrences such as the bed in the main bedroom shaking or being pushed from the foot end of the bed, like a weight pushing down, and a dent in the pillow that no-one has been lying on, have been witnessed/experienced by the occupant of the house and confirmed by both his parents when they were asked to lie on the bed. No mundane, physical explanation can be found for this – the bed has a very heavy, solid timber frame and sits firmly and evenly on the floor so no rocking or movement is possible. There are extra legs/supports under the centre of the bed to stop any possible sagging of the frame across the width of the bed. The mattress also sits very snugly on top of a pine slat base – the slats are solid timber so there is no movement possible in those either. The client has also sensed the entity following him around the house, sitting next to him on the lounge, lying on top of him and has seen shadows moving across the ceiling. The client’s 2 year old niece refuses to go into the main bedroom – she stands at the doorway and, fascinated by something in there, simply stares up at the ceiling – possibly looking at the ceiling fan (which is turned off) or maybe looking past the fan at something else(?) The client’s dog usually sleeps on a doggy bed in the corner of the main bedroom but now also refuses to go into the room. The client is very scared about the paranormal events he has experienced in the house and has smudged the house with sage many times to try to clear out the problem, to no avail. He is currently on a short overseas trip and is hoping for our clearing to be successful in his absence so when he returns his house will feel safe and free from paranormal activity. His mother is reluctant to enter the house while he is away but must do so to feed the fish and check on the place in his absence. The dog has been observed by the client’s mother, standing in the loungeroom looking at “nothing” and wagging its tail, as if happy to see somebody, then to start growling and back away from that area of the room. The client’s mother reported a feeling of heaviness and difficulty breathing when inside the house, with the main bedroom feeling the worst, and an awareness of “something” being in there with her. Experiencing the foot of the bed being pushed, and seeing the dog react to “nothing” in the loungeroom, and its refusal to go into the main bedroom, confirmed that it was not just her imagination. The client’s father, who says he was basically a non-believer in paranormal activity, until now, is also very worried and wants the “thing/s” gone. He also said they think there are 3 spirits in there. Activity in the house seems to have begun and then escalated with the client’s personal tarot readings (possible portals opened), also parties in the house involving lots of alcohol and some drug taking (altered states – people more open to entity attachment and bringing things into the house). When I first stepped into the house (kitchen area, opening into loungeroom) I felt the heavy, oppressive atmosphere, had difficulty breathing comfortably and needed to take a deep breath every so often – felt dizzy/head-spinny/weird (my usual reaction to paranormal stuff). There were lots of reflective surfaces – polished black marble benchtops and splash-backs, polished/glazed white cupboard doors, glass tabletops, large TV screen – all possible portals. I used my pendulum and was told there were 3 spirits in the house. The main bedroom felt even ‘heavier’. There was no wardrobe in this room and no mirrored doors. It had a manhole above the main doorway and a second doorway opposite end of bed, to the bathroom. As I walked in and stood next to the bed I felt uneasy and found it momentarily harder to breath. Standing at one corner at the end of the bed I felt a brief sensation of vertigo and had to put my hands out and move my feet to maintain my balance – it felt very weird. I had a similar sensation around the far side of the bed. My dowsing rods showed an E/W gridline running down the length of the main doorway side of the bed, a N/S gridline parallel to the foot of the bed (between the bathroom door and the bed) another E/W between the bed and the external wall, and a N/S running across the width of the bed right over the pillows. Jenni independently detected energies with her dowsing rods in the same areas where I believed the crossover points of the N/S and E/W gridlines to be. Interestingly, these crossover points coincided with the areas where we had all sensed something out of the ordinary in the room. The second bedroom felt better – much lighter than the first rooms. The built-in wardrobe had large mirrored doors but felt ok in spite of that. The study across the hall felt ok, although slightly ‘heavier’ than the second bedroom. Another built-in robe with mirrored doors, plus a computer with large shiny screen. The hallway had a wall-hanging over the front door of a native American Indian (head only) in full headdress glaring down – didn’t look friendly at all – needs to go, LOL. An arm-waving, ticking happy money cat was also in the hall, along with a feng shui money frog with a Chinese coin. The bathroom felt a little strange to me – slight headspins and momentary queasiness but that soon passed. We did a vigil in the loungeroom. I got the distinct sensation of somebody standing behind me threatening to put their hands on my shoulders or around my throat. I suddenly felt cold and shivery. It felt almost dangerous, yet perhaps more in a teasing way rather than with any intent to really do me any harm – just trying to scare me perhaps? I got the impression of a male presence. I also got an impression of the colour yellow. I kept getting the vision of yellow wrapped around someone’s neck and pulling tightly and choking. My throat felt very constricted as a result. The yellow became a narrow yellow satin scarf, perhaps worn by a man as part of a formal dinner suit – 1930’s style ? It was no longer choking anyone but was still around a man’s neck. Next came the word Amber, but in the context of a woman’s name rather than the colour. I don’t know if this has any significance to our investigation. We then went and laid on the bed to hopefully experience some paranormal mattress movement, but nothing happened! After we did the banishing ritual, smudged the whole house and closed all the doors/windows/reflective surfaces with banishing pentagrams the general atmosphere did feel much lighter and free from any oppressive, threatening feelings. I took a few photos of the various rooms but didn’t capture any images of orbs or any other anomalies. I will be very interested to hear if the client and his parents notice anything different about the energies in the house after our clearing. Curious too to know if the 2 year old niece decides it’s ok to go into the main bedroom. However, the real test will be whether the dog notices a difference and is happy to enter the house and sleep in the main bedroom again. It was a wet evening on 3rd April, 2010 when Janine, Jenny and I arrived at Annandale for this investigation. We met the client’s parents (the client was overseas at the time) who gave us an overview of what was occurring in their son’s house. They were both able to tell us that in the room where their son sleeps, the bed has been known to shake. He asked them both to lay on the bed with him and they were both able to corroborrate this occurring. The client’s mother also added that her son has dabbled in the Tarot, and she was concerned that he hasn’t been using them properly. There has also been the suggestion that people from all walks of life come and go; a more hedonistic existence of drug taking. I find it to be ironic at this point that I intended to bring my own deck to discern what I could find there, but I had forgotten to bring it. The client’s mother kindly lent me hers, which I used. Before this, though, I was aware of the oppressiveness in the air. I found it very difficult to breathe and I felt the need to constantly clear my throat. Since the main activity emanated from the client’s room, I used my dowsing rods and put them across the bed. The rods turned inward, indicating either possible activity or ley lines. King of Pentacles would normally indicate a person who is of the sign of Taurus, but I saw a small ornament on top of the fish tank or other such cupboard with the Scorpio glyph. We found out that the client is, indeed, a Scorpio. The King of Pentacles then indicates an opposition to what is being attempted by way of banishing any possible entities from the house. It is quite stubborn, rooted to the spot. A refusal to move. The Hermit offers an insight into the nature of this situation. A period of withdrawal and contemplation would ensue, in order to acquire the necessary knowledge that is needed to use any branch of divination and magic safely, along with utilising this knowledge for the highest good, personal growth and spiritual development. The Hermit is also a card that asks the querent to seek out their personal guide or guardian, at the very least, take note of the fact that they have one or more around them, and they can call upon them any time, knowing that they are safe and protected from harm. The Tower – I initially believed that the reverse position wouldn’t be so dramatic, but it could also be a two-edged sword. There is a reluctance to accept that change is on its way. Old habits, beliefs, structural thinking and general way of life no longer serve the purpose it once did. The reverse position of this card may indicate a blockage, a fear, perhaps. For those of us who use magic, in any of its forms, we expose ourselves to hidden mysteries, unlocking doors to hidden truths about ourselves and otherworlds that we are otherwise afraid to acknowledge. Once unlocked, however, there is no going back to how we once were. The only way, therefore, is to go forward. It would be beneficial to seek out others who are of like mind to join us on that part of our journey. We must bear in mind, also, that our journey is our own. What happens to us and how we deal with our own situation is unique. Accepting our challenges and playing to our strengths makes that journey much easier. It doesn’t mean that life gets any easier, but how we deal with it certainly does. It’s interesting that the second and third card are both from the Major Arcana part of the deck. When any card comes out from the Major Arcana, we are to be made aware that whatever is happening in our lives, it is of huge importance – be aware, take note! After shutting down the reading, Jenny was able to discern the directions of the ley lines and I was walking around the rest of the house, in an effort to pick up on what I was feeling – as that is how I always work in such situations. I was aware of the head of an American Indian hanging over the main doorway and my immediate reaction was that he had to go! The look on its face is menacing, and I felt the eyes boring into me while my back was turned. A Feng Shui ornament was opposite the front door, of a cat continuously waving. I found it to be in a rather inauspicious spot, as the energy would bounce back and forth on a closed door, going nowhere. The actual master bedroom seems to be the spare room for the client’s storage and wardrobe, as there are no such other items in the room he actually sleeps. This room has a lighter energy, despite the full length mirror doors on the wardrobe. Mirrors in a bedroom are not conducive to good energy as the sleeper may awaken to the sight of their soul during the astral state, making them wake in shock. One item I do like in the house is the fish tank. The fish he keeps are lovely and they are of an even number. I found nothing untoward in the study across the hall and moved back into the kitchen. I was in the corner of the kitchen looking at newspaper articles that are posted on the wall, and I suddenly began to feel sick. I then proceeded to the bathroom to see what I could pick up in there. The dowsing rods didn’t react in any way, but I had an image come to me of drug taking over the vanity, and I reeled back from it. The bathroom is two-way, from the client’s room and the kitchen/back door entry. The door to the bathroom from the client’s room was open, I would suggest it be closed for auspicious reasons – the client wouldn’t be preoccupied while he is trying to sleep. Closing the toilet seat down also allows for your good fortune to not be flushed away. My memory may be out of sync here, as I’m writing four days afterwards, but I think the next thing we all did was to check out the actual bed. After working out that the client has a king size bed which is quite solid and not easily movable by human means the three of us lay on it in anticipation. Apart from sharing one or two suggestive jokes about three women laying on a huge bed, the moment amounted to nothing. The bed didn’t shake, nobody was coming out to play. We moved out to the lounge room in an attempt to meditate on the overall energy of the place. Jenny and I both used pendulums to ask questions and not many answers were forthcoming. We asked if drug taking opened portals, if other people brought energy with them and left it behind, past girlfriend, dabbling in the tarot etc. We’ve all agreed that it is the client himself who is the lynchpin in the behaviour of the entity/ies as we didn’t encounter anything that was told to us previously. Although, while we were meditating, my right foot was sore, and I was told to keep my eyes open. Jenny felt like she was threatened with having something around her neck and choke her. Eventually, we conducted a banishing ritual and began the routine of cleansing the whole house. During this, the subject came up about the client frequenting psychics (that was mentioned several times during the course of the night) because he wanted a relationship partner. I suggested that statues and pictures of couples, paired items etc should be kept around the place. I didn’t want to hone in on the client’s character too much but since we were in his home (he is currently away on a holiday in Thailand) there is so much of his personality that is already embedded in the place, and I had difficulty disconnecting the two. This is where the Tower card may well come into play. The client wants to share his life with someone but would be somewhat reluctant to give up the lifestyle to which he has become so accustomed – the life of a young man who has been able to have and do whatever he wanted. Once satisfied that the house was smudged, sprayed and banishing pentagrams drawn about the more vulnerable areas, were we then able to leave. I am most curious as to whether there are any significant changes felt in the whole house, as we all noticed how much lighter the air quality was. I await new findings! The next day when the client’s mother entered his house she noticed a distinct lightening of the energy and felt much more comfortable about being there. The client was overseas during this investigation and he later told us he suddenly became very ill at the exact time that we were doing the cleansing and banishing ritual in his house here in Sydney. This further confirmed our thoughts that the entity is connected to him in some way. Although the client’s mother initially sensed the dense energies in the house had cleared after our preliminary investigation, as soon as the client returned home from his overseas trip the paranormal problem persisted. 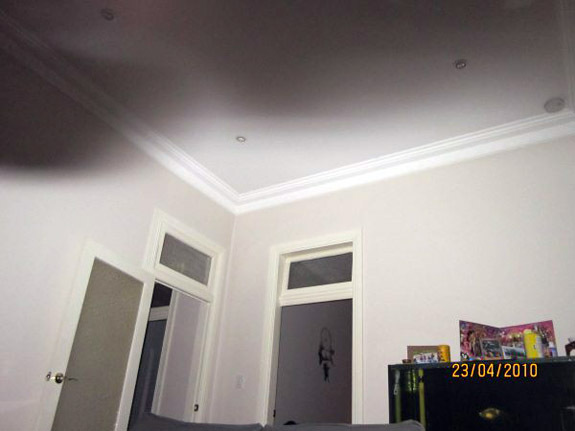 He was getting very scared of the situation in his house and sent some photos of what he was describing as a black mass that appears in the lounge room. 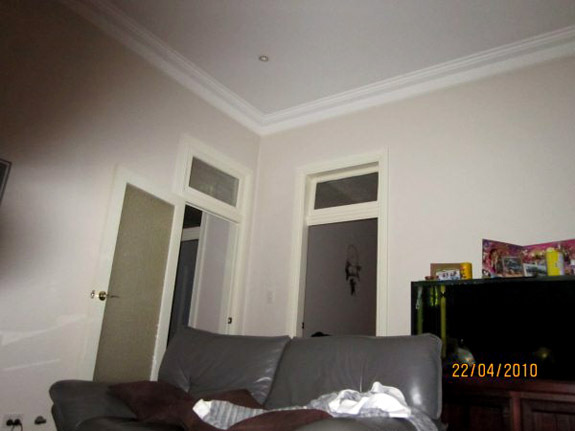 Below are three of many more similar photos he took around midnight on the evening of 22nd to 23rd April showing what appears to be movement of the black mass back and forth across the room. The SOuL Searchers team members attending this second investigation all viewed the photographs and “tapped into” the situation psychically from our own homes beforehand. On the evening of the 24th we returned to the client’s house and compared the impressions and ideas we had received from viewing the photos and discussed them with the client. We each independently received very similar impressions regarding the entity and its possible connection to the client’s personal life and some of his acquaintances, which the client generally agreed with and accepted as being quite plausible. It was obvious our efforts during the first visit had some benefits as the atmosphere in the house did not feel as “heavy” or oppressive on this second visit, and the dog, which had refused to go into the main bedroom before, was now snoozing underneath the bed where the mysterious mattress movement had previously occurred. Later on in the evening the dog had moved to her doggy bed in the corner of the same room, where she was previously too scared to go. We did more cleansing and banishing and put up more protective energetic barriers and also performed a group energetic healing and chakra balancing session on the client, and he said he felt much better afterwards. Six days later on the 30th April, we found out that the SOuL Searchers paranormal investigation at Annandale was a success. We had sent the entity on its merry way and the client was now sleeping all night and was extremely happy. A big thank you to the team members for a very professional job well done! Approximately one month later the client was again experiencing paranormal events in his home. Based on information acquired from him during our previous investigations and discussions with him about recent visitors and activities in his house since our last visit, we concluded that the paranormal activity was more likely to be that of a poltergeist. This is a spirit, usually mischievous and occasionally malevolent, which manifests its presence by making noises, moving objects, and assaulting people and animals. The term “poltergeist” comes from the German poltern, “to knock,” and geist, “spirit.” The phenomena may be produced by subconscious psychokinesis (PK) on the part of an individual. Separate studies done by parapsychologists Nandor Fodor, Alan Gauld and A. D. Cornell, and William Roll traced poltergeist existence and activity not in paranormal entities but in humans. According to their theories on the human-poltergeist connection, the force usually ascribed to poltergeists are powerful emotional and mental triggers in the human psyche. These theories have their foundations on the idea that poltergeist activity usually occurs in places which have seen much violence and suffering or around persons who are experiencing deep emotional turmoils. Roll even went as far as to name the phenomenon as “recurrent spontaneous psychokinesis” or RSPK. This refers to the expression of intense emotion like hostility, anger, and sexual tension from a human agent which causes inexplicable physical manifestations such as levitation. The agent is usually oblivious to the fact the he or she caused the disturbance because it is the subconscious mind which found a way to release any repressed emotion through psychokinesis. On the other hand, poltergeist activity without the presence of an agent is attributed to the remnants of intense emotions in a particular locale, a phenomenon similar to how a place gives one “the creeps” without any apparent reason. In this case, poltergeist activity is simply an outward manifestation of human emotion. It is perfectly controllable as long as the agent expresses pent-up feelings, hence, lessening chances of subconscious “poltergeist” activity. The second type of poltergeist activity described above is probably the closest to what we believe is causing the client’s current problems. He has identified a person who he feels could be the “agent” or the source of this activity. 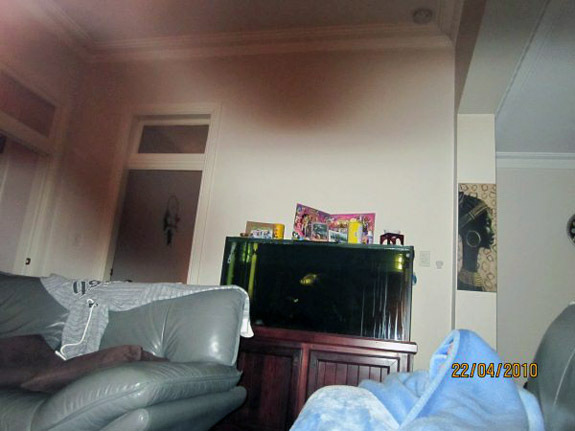 The possibility of this person being involved in some way, such as unknowingly bringing an attached entity into the house, was discussed at our previous investigation and advice was given to the client about personal shielding and energetic cleansing, as well as the suggestion that maybe it wasn’t a wise idea to bring this person into his house again. The onset of the paranormal manifestations corresponds with the introduction of this person and subsequent visits to the client’s house along with possible inappropriate use of the Tarot on these occasions. This person could be projecting energy towards him, either consciously or subconsciously, and it is manifesting in beds shaking, black shapes on the ceiling and the feeling of being followed and touched etc. We instructed the client further on the subject of personal shielding and house clearing and shielding and then we also performed a banishing ritual, in which he actively took part. We felt that with this practical experience plus written instructions to assist him to do the ritual on his own in the future to maintain the protective barriers around his house, that he could confidently protect himself from this “psychic stalking”. The client was very pleased with the results of our latest visit and all was well until only a couple of weeks later he once again had contact with the possible “agent” for the poltergeist activity, after which it all started again. We hope the client will, in future, make better use of the knowledge he has gained about psychic self protection and house clearing and shielding. It is also essential that correct and safe procedures be followed when using the Tarot or any other form of divination. Whether he acknowledges it or not, the client is actually quite psychic, and he does now have the ability to deal with this situation himself, rather than relying on others to do it for him. However, SOuL Searchers are always available for further help and advice if needed. Jenni’s Tarot reading, which was done on SOuL Searchers’ first visit to this house, turned out to be a very accurate assessment of this situation.